In previous lesson we have defined a structure called Shape to accommodate location and name of the geometric figure. But with that structure we cannot precisely describe any particular shape, like ellipse or rectangle. More fields are required to meet the needs. But these fields come in different packages when describing specific shapes. Ellipse requires two radius values, rectangle requires width and height. Some other shape would be defined with other values. To fully define each of the shapes means to step into its specific features, and those are ones not shared with other shapes. The following picture shows memory layout of our new structures. Now it becomes clear why Shape structure had to be instantiated within each of the instances: now Ellipse and Rectangle both contain fields that are common to all shapes - location and name. This process of extending one type to accommodate additional values is referred to as subtyping. It is said that Ellipse is a subtype of Shape. Rectangle is another subtype of Shape. Shape is called the supertype or base type of Ellipe and of Rectangle. For this reason, Shape-typed field in Ellipse and Rectangle structures was named _base (underscore was added to avoid mixing it up with base keyword, which is used in some object-oriented languages like C# to denote base type). When Shape structure was designed we have coded two constructors and a destructor. These functions had special purpose to initialize and release instances. Now we can ask a question: How should constructors and destructors operate on subtypes? Subtypes rely on their supertypes and so should it be with their constructors and destructors. Supertype defines a subset of values contained in the derived type. Supertype's constructor operates only on those supertype-provided values in order to initialize them for use. Subtype's constructor requires base part of the record already initialized, so we will enforce base type's constructor to be called first. Conversely, releasing resources added by the subtype may require base part of the record still operational. Therefore, subtype's destructor will fully execute and only then base type's destructor will be called to finish the job. We are now ready to define the Ellipse structure and accompanying functions. Observe implementation of the first constructor. It calls base type's constructor and simply passes this pointer to it. This may look awkward but recall from the Ellipse structure declaration that Shape structure was instantiated as the first element within the Ellipse structure. This means that pointer to Ellipse is the same as pointer to its _base member, which is actually a Shape structure instance. After ellipse's constructor has called base type's constructor, it simply initializes remainder of the Ellipse record, which boils down to setting the radiuses to neutral value. Destructor is the simplest part of the ellipse type and it is so because Ellipse does not add any dynamically allocated memory that should be released by the destructor. Therefore, ellipse's destructor simply relegates the call to base type's destructor to do all the work. Rectangle structure is defined in basically the same way. We will provide here only the declarations. 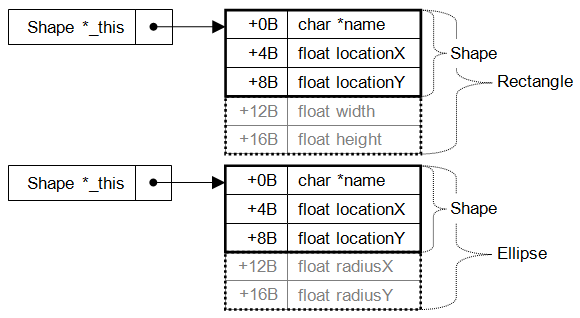 Below is the listing of main.c file which initializes one ellipse and one rectangle and then modifies their locations. Ellipse's location is (1.00, 2.00). Rectangle's location is (3.00, 4.00). Ellipse's location is (5.00, 6.00). Rectangle's location is (7.00, 8.00). By doing so, we have applied the principle called pointer type substitution. Pointer to subtype - Ellipse - is passed into function argument which is defined as pointer to corresponding supertype - Shape. So much about syntax. But to explain how does this code really work, we will have to take a look at the memory layout once again. Picture below shows a pointer named _this, which is an argument of a function receiving Shape (e.g. Shape_SetLocation function). Caller decides to pass a pointer to Rectangle structure instead. However, function knows only about "general" shape, with only name and location. Same case is when pointer to Ellipse is passed - function is oblivious of the radiusX and radiusY fields. Net result is that Shape_SetLocation function operates only on name, locationX and locationY fields, ignoring the presence of any other field, if there. Now it is obvious why Shape structure was defined as first field in the Ellipse and Rectangle structures. In order to pass pointer to subtype when pointer to supertype is expected, supertype-defined content must occupy beginning of the overall instance content. In previous sections we have thoroughly discussed object-oriented design of two structure types derived from Shape. In this section we will simply rewrite them into C++ classes: Ellipse and Rectangle, both subclasses of the Shape class. First listing will present declaration of the Ellipse class, contained in the ellipse.hpp header file. As already seen when Shape class was designed, class declaration is stunningly similar to structure and accompanying functions declaration. 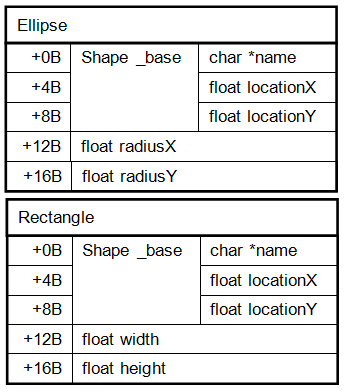 Class definition is provided in ellipse.cpp file. This piece of code raises some questions, syntactical rather than substantial. Parameterless constructor does not call parameterless Shape constructor explicitly. By convention, C++ invokes default (parameterless) constructor of the base class every time when not stated otherwise. This "otherwise" case is demonstrated by the second constructor, which explicitly calls Shape's constructor with two float arguments to initialize ellipse’s location to specific point. Also, we didn't have to specify the destructor because it would be empty - C++ compiler will add it for us. Rectangle class is defined almost the same as the Ellipse class and we will leave its implementation to the reader to exercise. And here is the main function which utilizes these two new classes. Observe how SetName and PrintOut methods have been called directly on objects of Ellipse and Rectangle classes. No casting was required to obtain pointer to base class. This is fundamental principle in object-oriented languages. Methods defined in the base class are present in the derived class as well. It is said that derived classes have inherited these methods from the base class.